The M4 is one of the most popular airsoft rifles in the US (and maybe in the world) because it is perfect in CQB situations, it’s easily upgradeable and customizable, and accepts magazines from other M4 designs. 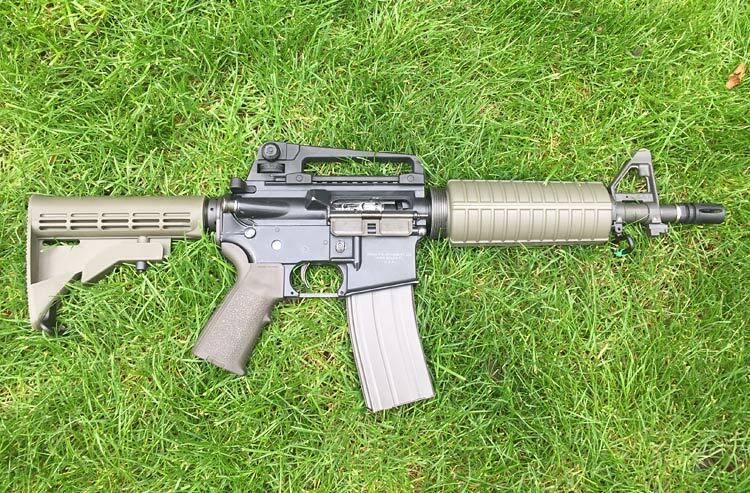 Basically, the M4 is one of the less picky designs on the airsoft market. But, if you dig a bit deeper, at the very base of this platform you’ll find the AR-15 (or the Armalite Rifle model 15). While in the airsoft world you won’t find that many AR-15s, in the real steel world, the platform is held in high regard. Designed for civilian use, the real steel AR-15 only has semi-automatic fire mode, which is why it is so popular among real gun users. The difference is well documented: the AR-15 was designed for civilian use (hence the semi-auto limitation) while the M4 (and its cousin, M16) were intended for military use (these can fire in full auto mode). In the airsoft world, where players can use rifles that fire in full-auto mode, it’s easy to understand why the M4 and M16 platforms are so popular and why the AR-15 is rare. After all, unless you truly want to use a semi-auto rifle, why would you go with this version? Most companies that do produce AR-15 airsoft rifles do so because they want to create a loyal replica of a beloved real-steel weapon. Now, since the M4 is extremely popular among airsofters, we will discuss the features that apply to this rifle model. However, since the AR-15 follows the same platform, the same features will apply. I always recommend a rifle with a metal gearbox and metal gears. This is the basic requirement of a durable rifle that gives the user a good game experience. If the internals are plastic, the rifle won’t be as powerful and for sure won’t hold for longer than a few games! Yes, metallic internals usually means a more expensive gun, but you can choose rifles designed by brands like CYMA or ICS, which are famous for their affordable, but reliable products. I am not saying that reputable brands don’t have their duds, but it’s easier to identify a rifle with good internals. Finally, make sure you choose an airsoft rifle with adjustable hop-up. This is important for getting the right backspin on your BBs since each model has a different approach to shooting the BB out of the barrel. Because the best M4 airsoft rifles get most of the CQB action, the muzzle velocity (measured in FPS) is important. I hear and see airsofters bragging about their high-end rifle, with 400+FPS that will lay waste on their enemies. But high muzzle velocity, in a game of airsoft with other competitors, can be a downside. Powerful rifles can inflict injuries on other players and can get you disqualified from the game. Most M4 and Ar-15 rifles will get you about 350 FPS, which is enough for CQB situations. One of the reasons why most airsoft players got caught in the game is represented by the weapons! Most of today’s rifles and pistols look so good that it’s difficult to set them apart from real-steel ones, and this is extremely attractive. Still, not all airsoft guns are designed with quality in mind, which is why I always recommend a metallic or ABS body (combinations are also great) with a rail system. A good rail system (keymod, Picatinny, or others) allows you to get a basic weapon and improve upon it by adding accessories. Not to mention, some rail systems look badass. Finally, in choosing the best-looking M4, I always like to go with replicas of real-steel rifles. You don’t even have to spend a lot on it because there are many producers who specialize in M4s. There are many factors that weigh in on this aspect, but the ones I found most convincing are the size, weight, and the presence of ambidextrous controls. Also, it helps if the rifle has a fore-grip or allows you to install one. Basically, it’s best to choose a rifle with a collapsible stock, with a metallic and ABS body and possibly sling mounts so it’s easier to carry in an open field. As I already mentioned, the M4 is one of the most popular platforms on the market. This popularity is also due to the fact that most models come with internals that can be upgraded. In conclusion, you can start with a basic gun and upgrade the internals in time – this way you don’t need the entire budget at once. This is an entry-level M4, with ABS body and lots of accessories (due to the 4 available rails). It is lightweight and durable, and the retractable stock makes it easy to adjust to your needs. Overall, the aspect is impressive, and I think the rifle fits both beginners and advanced players. 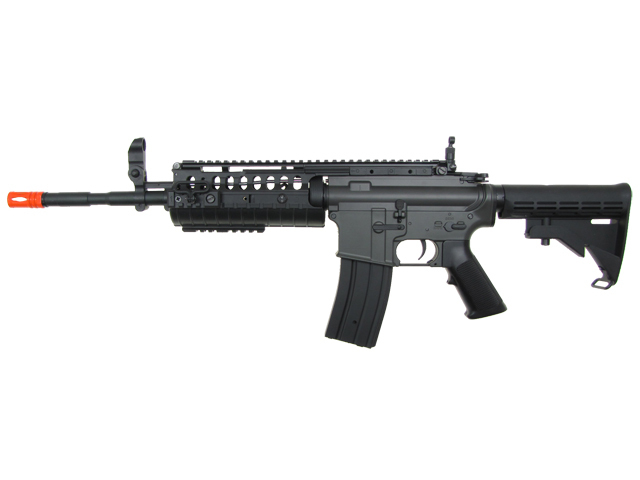 The M4 version from Cybergun (licensed with COLT markings) is a high-end design that supports a 300 BBs high-cap magazine and a multi-position crane stock (which also houses the battery). Due to the metallic components, the rifle is heavy, feels amazing in your hands, and implements a durable design. I also like that the rear iron sight can be adjusted or removed (according to your needs). Overall, this M4 is an AEG I would love to carry on any field. If you’re looking for something a little more stylish for your next game this AEG will do the trick. It’s almost entirely metallic (except for the upper and lower receiver), it has a healthy weight, and the 8.4v 1100 mAh battery is pretty good. The adjustable hop-up is a nice touch for accuracy and the flip-up front and rear sights are useful if you don’t have a scope. This is a special edition rifle that wants to copy the real-steel Demolition Ranch AR-15 gun. Equipped with Silver Edge gearbox and metallic internals that move smoothly, the UDR-15 is a great design that brings a bit of blowback (electric) in your life. The reason I selected this rifle is its high compatibility with professional brands such as Tokyo Marui. Built with high-quality materials, this GBB rifle is powerful, has a nice weight in your hands, and gives you a very real-steel impression. The receiver is a 1-piece aluminum billet-style, which is one of the most durable on the market and the keymod rail system is perfect for a wide range of accurately installed accessories. The stock is retractable, and the trigger is skeletonized to reduce any resistance. Also, the grip is made of high-quality ABS, to increase adherence when you hold it. Finally, the iron sights are adjustable and can be removed if you want to install a scope. As you can see, the AR-15 platform doesn’t come in low-prices, especially when it’s the exact replica of a real-steel design. On the other side, the M4s come in all shape, sizes, and prices, so you can enjoy yourself on the field depending on your own personal budget.